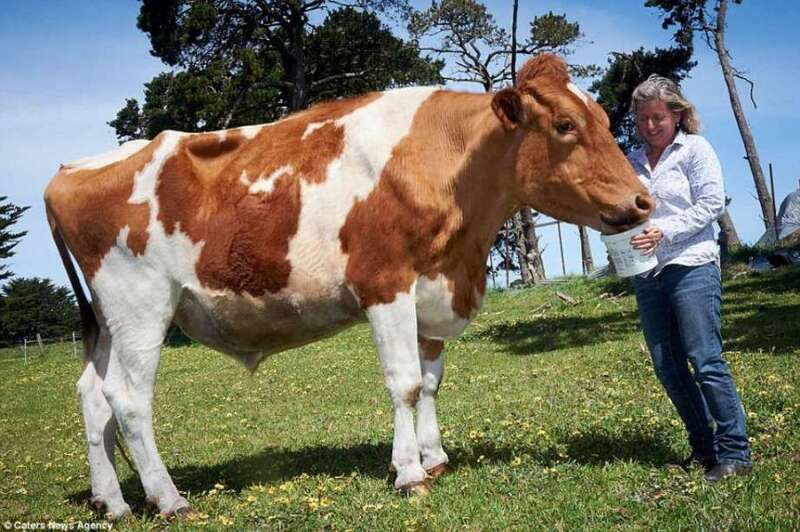 Casting a shadow over his owner with his hulking frame, this is Australia's largest cow Big Moo. The bovine behemoth weighs over a tonne and measures an astounding 14-foot-long and 190cm tall, dwarfing his cattle companions in Glencoe, South Australia. In spite of his formidable stature, Big Moo is said to be a gentle giant who loves nothing better than a scratch and a tickle. Down under, new research carried out in north Queensland could drastically reduce the impact the agricultural industry has on the global environment reports ABC. They are studying the effects seaweed can have on cow's methane production. It is reported that they have discovered adding a small amount of dried seaweed to a cow's diet can reduce the amount of methane a cow produces by up to 99 per cent. The species of seaweed is called Asparagopsis taxiformis, and JCU researchers have been actively collecting it off the coast of Queensland. Life and outlook is quite different out there – there reportedly are roughly 29 million cattle in Australia. Most of these animals are raised to be killed for food. The rest live in a continual cycle of reimpregnation and milking until finally they too are killed. While naturally a cow can live up to 20 years, even dairy cows rarely live beyond the age of 7. Recently, Australian Agriculture Minister Barnaby Joyce pushed for negotiations over a proposed new rule disrupting the live cattle trade to Indonesia to be resolved as quickly as possible, warning any interruption to trade will hurt exporters, importers and Indonesian consumers. No cattle were exported to Indonesia in September this year from Australia, due to permit delays amid negotiations over a proposed new policy requiring importers to bring in one cow for breeding for every five cows to be fattened for slaughter. Cows are holy … Komatha is sacred to us.. we worship cows … Thiruvallikkeni, the land of Lord Parthasarathi, the cowherd king, true to its tradition has many cows ….. but the cattle roam menacingly on the road, sometimes injuring people….. till a few decades ago - cowherds flourished – now a days, almost none buy milk direct from them – now they are a vanishing tribe .. there are still cows – they inject and milk them .. then let them roam on the street feeding on vegetables, trash and more … sometimes they thrash the cows with sticks … one would feel sad upon seeing cows running helter-skelter in fear – clear they do not get the right feed, do not get to have their usual life, artificially inseminated, male-calf killed or taken away – as long as they give milk, some care – and then let loose when felt of no use…. Sad to look at the animals eating food from garbage dumps and leftovers. They are left uncared for – injected and then milked. Elsewhere, for identifying the farm animals they brand them with hot iron, and in the name of Insurance, they pierce their ears with tags.. this is not the usual Triplicane post – but something on hi-tech cows elsewhere !!! 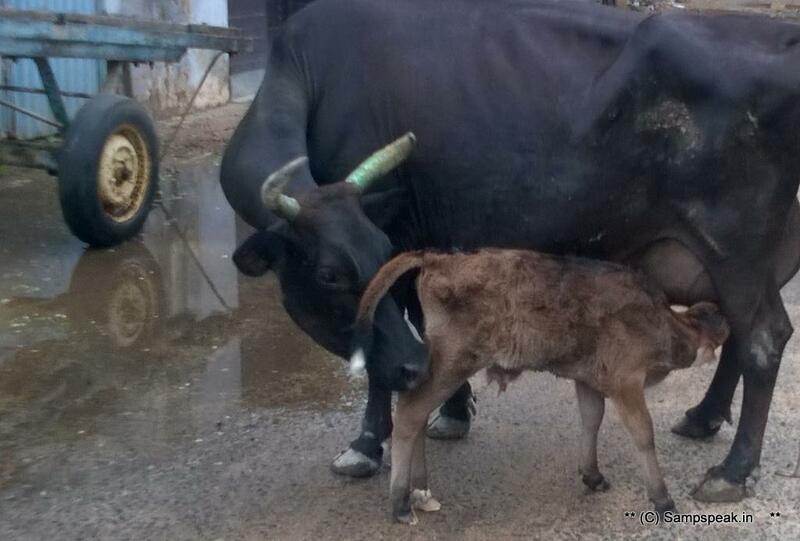 Soon, farmers won’t have to wait to take their cows to the cattle crush to see the vet. A text message will tell them what’s wrong- reports MSN today. An Austrian startup, SmaXtec , is placing connected sensors in cows’ stomachs to transmit health data over wifi. The sensors, each the size of a hot dog, track minute-by-minute data about the temperature of the cow, the pH of her stomach, movement, and activity, and they identify when the animal is in heat. They can predict whether or not a cow is pregnant with 95% accuracy, therefore letting farmers take advantage of increased milk production prior to calving. When changes are monitored, the farm staff receives a text update. The device, which has roughly four years of battery life, is inserted into the first of four stomachs through a cow’s throat using a metal rod and lodges in the rumen, Bloomberg reported. It can be hard for humans to tell a cow is ill until there are visible signs of sickness, but the sensors can pick up and report changes even before there are physical symptoms. “It’s easier, after all, to look at the situation from inside the cow than in the lab,” SmaXtec cofounder Stefan Rosenkranz told Bloomberg. The 24/7 monitoring may not be able to pinpoint the exact reason for bodily changes, but it can still help with earlier and more accurate detection of the onset of any illness. Nearly 350 farms across two dozen countries are reportedly using this technology to monitor livestock. Over the last six years, the devices have been implanted in 15,000 cows in Britain. On its website, SmaXtec notes that covert measurement is safer and reduces the chances of losing a measurement device too. SmaXtec sees a big opportunity for its sensors because of the “90 million cattle on dairy farms around the world,” but the opportunity may in fact be even bigger. The Economist’s global cattle count places the cattle population at 1.4 billion ! !